The main goal of a monitoring system is to detect and notify about problems and, where possible, automatically solve them. In Network Olympus, the scenario building engine provides the ability to generate various types of actions and notifications based on the results of sensors and actions. The status of the result (event status) determines which scenario branch is followed. If one of the parameters is beyond the acceptable range or an error occurs during execution, then a Down event will be generated and the subsequent scenario elements along the red branch are performed. If everything is fine, then the green branch is performed. 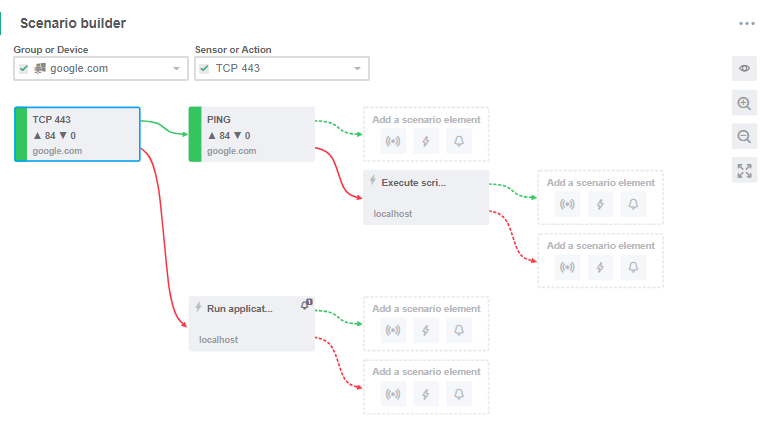 A scenario is a sequence of sensors, actions, and notifications that form a logic execution chain. This feature allows you to create flexible monitoring plans, more accurately identify issues and malfunctions and automate the process of their elimination. To create a scenario, use the Scenario builder, located on the dashboard of the same name. The displayed scenario depends on which device, group, sensor or action is selected in the dropdown field at the top of the widget. On the first step when creating each individual scenario, only a sensor can be added. To do this, click the button under Create a new scenario. On the subsequent steps other scenario elements (sensors, actions and notifications) can be added to each branch. When you choose to add a new element, this element's wizard will open. For more information about this, visit the Monitoring section. Previously added sensors and actions can be edited using their context menus. From their editors, parameters of the notifications assigned to them can also be changed. To change the scale in the Builder, use the mouse wheel or buttons +/– on the right side of the widget. From here, you can also restore the default position and scale. Check whether the devices in the group are online. If the device is online, then record this in the log file. If an error occurred while checking the device, send a Jabber notification to the system administrator and log the event. Check the value in the registry key on the remote server. If the value deviates from the norm, then execute a script that restores the required value. Check the availability of the server. If the server is available, then check the availability of the company website. If for some reason one of the operations resulted in an error, restart the server and send an email to the system administrator.